The solar panels are all laid out at the PUD’s new microgrid solar array near the Arlington airport, as seen Friday, April 5. 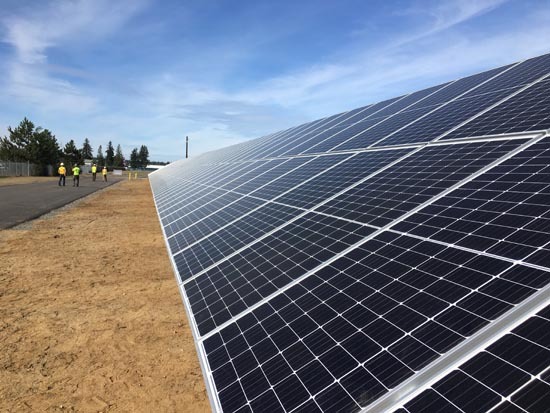 PUD customers will be able to purchase units of energy production from the solar array starting April 22. EVERETT — Installing a home solar panel system can be pricey, but a PUD program related to its upcoming solar project lets everyday people get in on green energy. The offer is to purchase a piece of the energy produced by the PUD’s solar array in Arlington, and the payback is a drop in the monthly power bill. Opening day for the public is at 8 a.m. Monday, April 22 — Earth Day. Information presentations are scheduled for 5:30 and 6:15 p.m. on Thursday, April 11 at the Monroe Library, 1070 Village Way. The program’s intent is to give people who may not be in a position to put up their own solar panel system a way to get involved with solar power. People who already offset their power bills with home solar panels are not allowed to participate. Arlington airport that should generate approximately 630,000 kilowatt hours for the grid annually, equivalent to fully powering 50 homes. The panels are all up and finishing work to hook it up is set to be completed around June. The buy-in cost is $120 for the equivalent to one-fifth of a panel, which the PUD calls a unit. Each paid unit can generate approximately 75 kilowatt hours each year. The payback is 0.06 cents for each kilowatt hour which the panel section produces, plus an anticipated state incentive energy credit worth 0.16 cents per kilowatt hour. The paybacks are reductions on the PUD bill each month for the next 20 years. The state program runs through 2028. Sunnier months naturally generate larger returns than winter months. All in all, the PUD calculates a $120 investment could net a straight $4 off the power bill each year, or $80 if kept the whole 20 years, plus about $12 off with larger state credit. Overall, a $120 investment for one unit could knock off $186 from the power bill over 20 years by the agency’s calculations. A five-unit purchase equal to a full solar panel for $600 would net $930 back over 20 years. The equivalent to powering half a home is 75 units, which would cost $9,000 in the program and return some $13,000 off the power bill over 20 years. It could take eight years for a full return on investment, the PUD estimates. To be clear, you are not sponsoring part of a specific panel, but buying into the system’s energy production. Only people who have PUD accounts are eligible to invest, and the investments are transferable from house to house. If you move out of Snohomish County, you can sell the investment to another PUD customer on the free market or sell it back to the PUD on a prorated basis, PUD new energy program manager Suzy Oversvee said. Contractor A&R Solar of Seattle is putting up the 1,620-panel array using panels sold by a Norwegian company that are made in Singapore. The PUD didn’t have a say in the contractor’s panel source. The panels are fixed, and do not swivel to track the sun, because panel systems that move cost more. More than 100 people came to two community presentations held back-to-back in Everett in mid-March. The first forum was standing-room-only. The PUD considers the microgrid a pilot project, project manager Scott Gibson said. If it goes well, the utility will consider building more like it. An investment buy-in is capped to 130 units total. That’s to prevent anyone from cornering the market, PUD spokesman Aaron Swaney said. This year’s legislation advancing in Olympia to require utilities to be carbon-free by 2045 would have less impact for the PUD versus other power utilities in the state; the PUD has no investments in coal or natural gas, and what coal and gas power the PUD gets in its power mix is purchased through the Bonneville Power Administration. Approximately 14 percent of the state’s full power mix picture was coal as of 2015. Grants and loans paid for the PUD’s microgrid installation. The community buy-in program is meant to give the community a way to buy into solar, Swaney said. To learn more, visit www.snopud.com/communitysolar or call 425-783-1700.